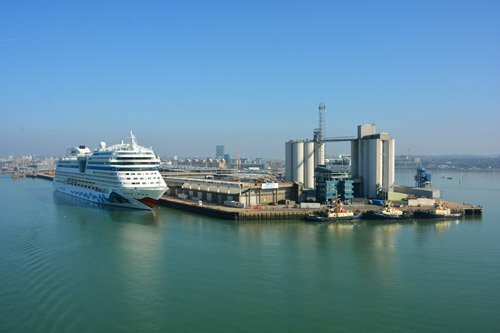 Our Southampton cruise port guide gives you information about the docking location, cruise dock, transportation options and much more! Welcome to the Southampton cruise port guide. Southampton is the largest city in the county of Hampshire on the south coast of England. It has a population of approximately 250.000. This historical town might be small but is quite remarkable. Excavations show finding of over 9000 years ago. Large saxon settlements, viking settlements and much more. The old town that still stands in Southampton today bares witness to these times gone by. Southamptons unique geographical location is and always has been an important port and therefore trade always thrived here in this small town. 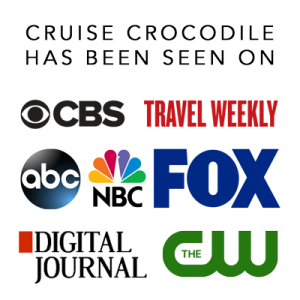 Even cruise ships take an important part in the history. It was the home port of the famous Queen Elizabeth 2 or better known as QE2. The Titanic even sailed out of this port carrying hundreds of crew members from Southampton with it. Also the historical Mayflower started its voyage from Southampton to take the pilgrim fathers to the United States of America. Southampton itself is not the most exciting town in the U.K. and if you are planning to stick around do make sure you either keep in mind to have an easy day or go into the amazing history behind the historical monuments that still stand today. In Southampton you will find many docking opportunities. All docks are designed to get embarking guests on and disembarking guests off as fast as possible. This Aida ship is docked at the QEII terminal. This one of several docks available in Southampton. You can always check online where your ship will dock. Southampton has many cruise terminals. 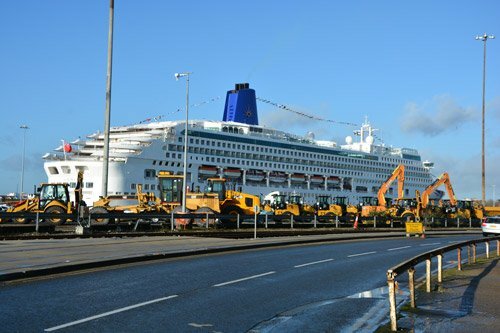 Where your ships is docking in Southampton will make a large difference in planning your day ashore. Along the shore line there are many different docking spots that can either be close to the city and facilities or not. Therefore it is always wise to check where your ship is scheduled through this LINK. Berth 46, 47 = Ocean Cruise Terminal. Uses DockGate 4 From here it is 0,6 mile to walk to the city centre. Berth 38, 39, 40 = QEII Terminal Uses DockGate 4 From here it is 1,3 mile to walk to the city centre. Berth 101, 102 = City Cruise terminal Uses DockGate 8 or 10 From here it is about 0,5 mile to walk to the city centre. Berth 105, 106 = Mayflower Cruise Terminal Uses DockGate 10 or 20 From here it is about 1,7 mile to walk to the city centre. 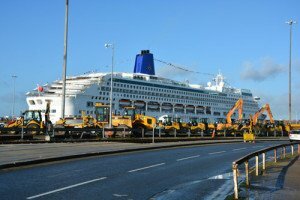 All the cruise terminals in Southampton are fully equipped to have even the biggest ship have 1000’s of guests disembark and embark the ship. Facilities for regular visitors are limited. There are usually maps, sometimes a tourist information and taxis at the terminal. Check with your ship if they will provide a shuttle service into town. When the ships dock at the terminals furthest away from the City, the Council’s Museum Service often (but not always!) runs a free shuttle bus that stops at Sea City, the Maritime Museum. The QE2 mile is High Street and Above Bar street. Together this street runs through the old and new town as it links the city park and waterfront. Walk it from beginning to end to see the main highlights of Southampton. City Exhibition The city of Southampton has done a really good job creating an open-air exhibition out of Southampton. In the old town they give you lots of information through tiles like these for example. 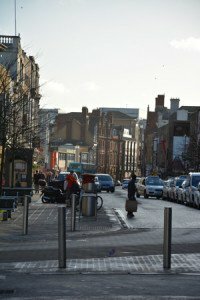 Knowing where you walk does enhance the experience and Southampton really knows how to do this! This showcases the history of aviation in the Southampton area. It has 18 aircraft of various types, including a Spitfire and a Flying Boat. Check the tourist maps as it is a little difficult to find in Albert Road, to the east of the City centre! A gorgeous old structure stands here in ruins in the city centre of Southampton. It was erected in 1320. It was destroyed during WWII. It is preserved by the people of Southampton to honour those who served the Merchant Navy and lost their live at sea. It also holds one of the Titanic memorials. This ancient House dates back to the times of the Tudors (Henry VIII and his 6 wives is the best known of these!). It now houses the City’s main historical Museum. This monument is without doubt the eye catcher of the city. It was constructed in 1180 by the Normans. For centuries it has been the entry and exit to the city of Southampton. It still stands here proud today as a gate between old and new Southampton. On a regular basis the tourist guides organise city walks from here. They usually have an information sheet for you about this in the terminal. These walks are run by volunteers that have a special love for their city. Stonehenge is a prehistoric monument in Wiltshire, England miles, 30 miles northwest of Southampton. One of the most famous sites in the world, Stonehenge is the remains of a ring of standing stones set within earthworks. It is most easily reached by train to Salisbury station, where coaches will take you to Stonehenge. Salisbury cathedral is also worth a visit. Check the schedule on http://www.nationalrail.co.uk. The original walls of the old city of Southampton are still visible all over town. In many ways they are implemented into modern day life, but they still tell the story of what happened here centuries ago in medieval Southampton. They date back to the Norman Invasion in 1066. Many wine vaults survive from the same period. This is the largest shopping mall of Southampton with about 150 shops. You could easily spend a day in here. From Southampton you also have the opportunity to go to London. This is a train ride away. It takes about one-and -a half to two hours, so you need to get off the ship early if you are to see anything and get back before it leaves! Check the schedule on http://www.nationalrail.co.uk. Titanic is still a prominent subject in Southampton. When the ship left the docks of the Ocean Terminal in 1912 4 out of 5 crew members were from Southampton. The tragedy of the Titanic therefore had a massive impact on this small town. Find several memorial monuments all over town and a special exhibition at the Sea City Museum. This is the oldest building in Southampton. Since 1070 this church has stood here at its prominent spot in the city centre, at the centre of the Old Town.